The University of New England’s Associate Professor John Paterson was today awarded the 2016 Anton Hales Medal by the Australian Academy of Science (AAS). Named after the founder of the Research School of Earth Sciences at the Australian National University, the Anton Hales Medal recognises distinguished research in the Earth Sciences. 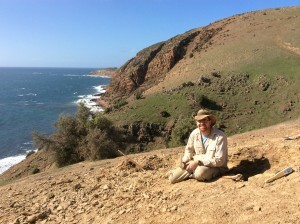 A/Prof Paterson, an Australian Research Council Future Fellow, is a world-leading researcher on the earliest animals in the fossil record, using exceptionally preserved Australian fossils to answer major questions relating to the evolution and ecology of marine fauna over half a billion years ago. “I am extremely honoured and grateful to the Academy for awarding me the 2016 Anton Hales Medal, and I’d also like to acknowledge my collaborators who have taken part in my research,” A/Prof Paterson said. The award will be formally presented at the Academy’s annual three-day celebration of Australian science, Science at the Shine Dome, in Canberra in May 2016. For further information, please contact John Paterson on 02 6773 2101 or jpater20@une.edu.au.